Photo: William Xu and Maui Orozco with Congresswoman Dr. Judy Chu (D-CA), the first Chinese American woman elected to U.S. Congress. Las Vegas, NV—This past August, NAPA engaged in a historical gathering of Asian and Pacific Islander Americans (APIA). 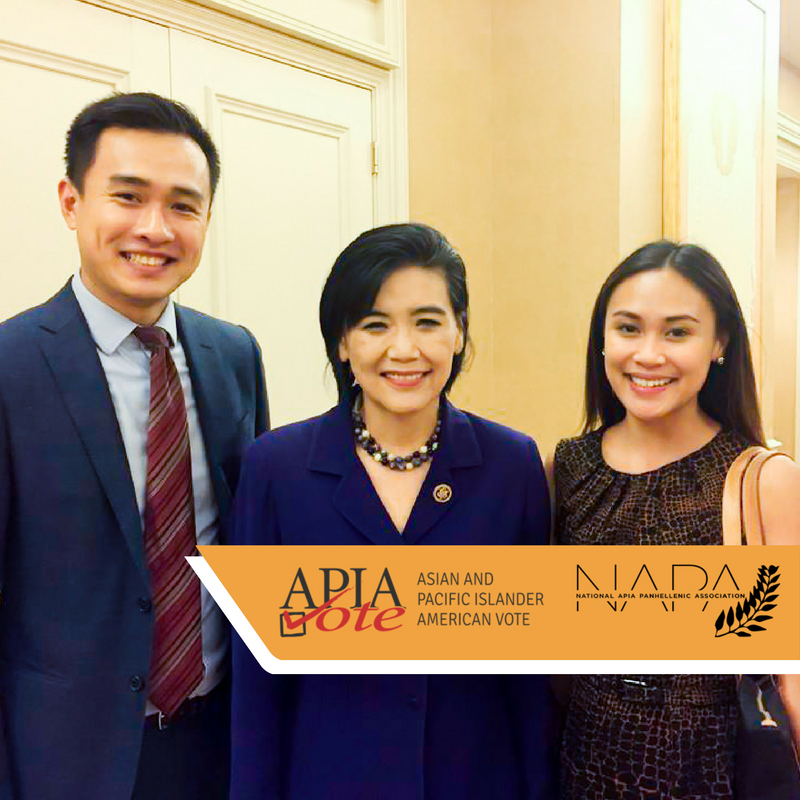 Four U.S. presidential campaigns met representatives of APIA affinity groups from around the nation at the 2016 APIA Vote Presidential Townhall. The candidates and their political surrogates appealed to the gathering of APIA leaders for their support. Alpha Phi Gamma’s Maui Orozco, along with Pi Delta Psi’s Will Xu, represented the NAPA community at the public forum. The presidential candidates present, which included Jill Stein of the Green Party and Gary Johnson of the Libertarian party, sat down with NBC anchor Richard Lui to discuss salient topics ranging from immigration reform to national security. Gary Johnson was even quizzed on what “AAPI” stood for. President Bill Clinton took the stage for his partner and democratic nominee Hillary Clinton. He framed the racial and political plurality of our nation as a defining strength and advocated for unity amidst narratives of extreme divisiveness. Finally, Utah Attorney General Sean Reyes addressed the crowd on behalf of Donald Trump. He leveraged his Filipino roots to discuss the conservative, hardworking values instilled in him by his immigrant parents, and how these values can help our community achieve a shared American dream. The town hall coincided with the Asian American Journalist Association and the National Asian American Association of Professionals Conventions, bringing together the largest gathering of Asian American professionals in recent memory. NAPA’s participation in the APIA Vote youth civic engagement training sessions opened future opportunities to expand coalitional programming efforts. Student leaders learned how to galvanize campus populations and utilize non-profit resources to improve “Get Out The Vote” campaigns across the country. With the NAPA logo projected on the backdrop as a supporting partner of the APIAVote Presidential Townhall, NAPA has now taken part in its fourth Presidential Town Hall, continuing its tradition of partnership with APIAVote that gave birth to NAPA over a decade ago. NAPA’s participation ensures a pipeline of leaders from Asian-interest fraternities and sororities to the public sector, exposing its membership to opportunities in non-traditional career paths where APIAs continue to be underrepresented. NAPA’s youth vote advocacy initiative maximizes exposure to the community it serves, combats existing stigmas of apolitical involvement, and forges crucial partnerships that will define NAPA a decade from now.